While bitcoin and other cryptocurrencies have suffered precipitous falls in recent weeks, the units remain popular in Nigeria where they make it easier to do business. On the surface, digital coins may not seem like a good idea in a country where corruption is rampant and stacks of hard cash are often smuggled overseas. Yet West Africa's biggest economy has the world's third-largest bitcoin holdings as a percentage of gross domestic (GDP), behind Russia and New Zealand, according to Citigroup. That may be because blockchain technology—public, online ledgers that underpin cryptocurrencies—is liberating Nigerians sidelined by the global financial system as it dramatically improves the ease of doing business. Olaoluwa Samuel-Biyi, a slight 27-year-old entrepreneur, looks the part of an aspiring corporate disrupter, dressed in skinny jeans with dishevelled hair. He first considered using cryptocurrency when credit card firms and other established payment providers refused to partner with his global remittance company, deeming the venture too risky. "They said the markets were too high risk and that people could finance terrorism," he told AFP, laughing. "It's ridiculous." He realised that the only way he could solve the problem was to use cryptocurrency. "It's so hard to send money from Nigeria to Zimbabwe, or from the United States to Sudan," he explained. Banks were "very tedious" and payment companies "generally exploitative", he said. "There's heavy discrimination, definitely. We have to go all around them to succeed." Samuel-Biyi's company, SureRemit, developed its own virtual token—a kind of custom cryptocurrency like bitcoin or one of the many alternatives such as ether. The tokens are used to buy vouchers, which may be used to purchase goods and pay bills at participating merchants anywhere in the world, cutting out cumbersome middlemen and eliminating fees. In January, SureRemit held its "initial coin offering" (ICO), a form of online crowdfunding where people purchase the tokens to be put in circulation for use in eight countries, mostly in Africa and the Middle East. The 500 million tokens, each worth two US cents, sold out in just two days and were snapped up by major cryptocurrency players, including South Korea's Hashed, raising $7 million for the company. "We were expecting scam allegations," said Samuel-Biyi, referring to Nigeria's unenviable reputation for online financial fraud. "But the world really accepted it." If the token system works, SureRemit stands to take a chunk of the world's remittance market, which was worth $429 billion in 2016, according to the World Bank. It's hardly surprising that SureRemit was conceived in Nigeria: remittance flows that year were worth $19 billion—more than four percent of GDP. Sub-Saharan Africa has some of the highest remittance costs in the world, with the most expensive fees seen within the continent. To send money from France to Mali incurs a five percent fee, a quarter of how much it costs to send from Nigeria to Mali. Such high fees have for years forced Nigerians to find alternative, sometimes risky, ways to transfer money. "I remember back in 2004, e-gold (a defunct digital currency) was the only option anyone in Nigeria had to make online payments," said Tim Akinbo, the founder of Tanjalo, a Nigerian exchange where people can buy bitcoin with the local naira currency. "There are still African countries cut off from international commerce online. Bitcoin is technology that allows financial inclusion." The depreciation of the naira, which has sunk to 305 against the US dollar from 169 in 2015, has made cryptocurrencies even more attractive—and the authorities are paying attention. Nigeria's central bank governor Godwin Emefiele warned recently that "cryptocurrency or bitcoin is like a gamble", though the Senate has launched an investigation into "the viability of bitcoin as a form of investment". Stern warnings haven't made an impact on trading, said Owenizi Odia, Nigeria spokesman for Luno, another cryptocurrency exchange operating in the country. "I think there's an acknowledgement that this technology is the future, going beyond bricks and mortar to improve cost efficiency," added Muyiwa Oni, an analyst at Stanbic IBTC Holdings in Lagos. "For now we're still trying to distinguish who the main players will be." Samuel-Biyi hopes to be one of them. "Whether or not the authorities call it gambling, Nigerians are just looking for any opportunity to get ahead of the curve," he said. "It's part of the hustle." The head of the Bank of International Settlements, the central bank for central banks, on Tuesday lambasted bitcoin as a speculative bubble and said authorities need to be ready to protect public trust in the financial system. While acknowledging the intention of bitcoin’s developers to create an alternative payment system with no government involvement, “it has become a combination of a bubble, a Ponzi scheme and an environmental disaster”, said BIS’s general manager, Agustin Carstens. Delivering a lecture co-hosted by Germany’s central bank, Carstens said that authorities need to be vigilant as cryptocurrencies could undermine the public trust in the financial system. While cryptocurrencies, led by bitcoin, soared in value last year, authorities in most countries stood on the sidelines, while in some countries they embraced the technology that promises to cut the costs of financial transactions. But as the value of bitcoin — the best-known virtual currency — has tumbled from its December high of nearly $20,000 to less than half that value with wild daily swings, regulators have taken a more critical outlook. China recently vowed to fully stamp out cryptocurrency trading after cracking down on it late last year. South Korea has also cracked down on cryptocurrency exchanges to reduce the risk of money laundering. Carstens said the volatility of cryptocurrencies undermined their utility for transactions and a store in value, thus apparently leaving their main use as a means for criminals to move money. He called for particular vigilance in allowing cryptocurrencies to “piggyback” on the financial system with links to regular bank accounts. A number of leading US and British banks have recently announced bans on purchasing bitcoin and other cryptocurrencies with credit cards. Bitcoin trading exchanges, which function like brokerages and hold their client balances, have proved targets for hackers, with a Japanese exchange Coincheck hit by a $530 million heist last month. Carstens, formerly the head of Mexico’s central bank, said that cryptocurrencies may not yet pose a systemic risk. “But if authorities do not act pre-emptively, cryptocurrencies could become more interconnected with the main financial system and become a threat to financial stability,” he said. Cryptocurrencies have also come under criticism for using vast amounts of electricity. The first modern Briton had dark skin and blue eyes, London scientists said on Wednesday, following groundbreaking DNA analysis of the remains of a man who lived 10,000 years ago. Known as “Cheddar Man” after the area in southwest England where his skeleton was discovered in a cave in 1903, the ancient man has been brought to life through the first ever full DNA analysis of his remains. In a joint project between Britain’s Natural History Museum and University College London, scientists drilled a 2mm hole into the skull and extracted bone powder for analysis. 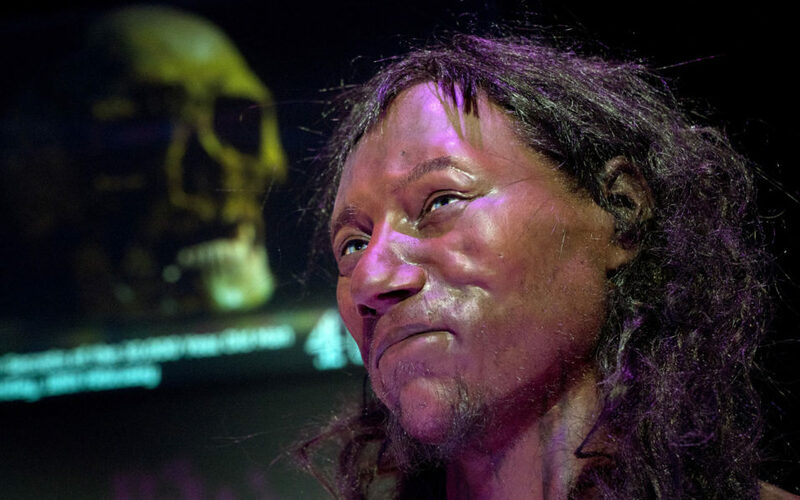 Their findings transformed the way they had previously seen Cheddar Man, who had been portrayed as having brown eyes and light skin in an earlier model. “It is very surprising that a Brit 10,000 years ago could have that combination of very blue eyes but really dark skin,” said the museum’s Chris Stringer, who for the past decade has analysed the bones of people found in the cave. The findings suggest that lighter pigmentation being a feature of populations of northern Europe is more recent than previously thought. Cheddar Man’s tribe migrated to Britain at the end of the last Ice Age and his DNA has been linked to individuals discovered in modern-day Spain, Hungary and Luxembourg. Selina Brace, a researcher of ancient DNA at the museum, said the cave environment Cheddar Man was found in helped preserve his remains. “In the cave you have a really nice, cool, dry, constant environment, and that basically prevents the DNA from breaking down,” she said. A bust of Cheddar Man, complete with shoulder-length dark hair and short facial hair, was created using 3D printing. It took close to three months to build the model, with its makers using a high-tech scanner which had been designed for the International Space Station. Alfons Kennis, who made the bust with his brother Adrie, said the DNA findings were “revolutionary”. “It’s a story all about migrations throughout history,” he told Channel 4 in a documentary to be aired on February 18. “It maybe gets rid of the idea that you have to look a certain way to be from somewhere. We are all immigrants,” he added. The Dow industrials tumbled more than 1,500 points at one juncture Monday, the worst intraday fall in market history. The drop by the Dow was bad enough during most of the trading day, but the dive that happened around 2:40 p.m. ET started to resemble the 2010 flash crash at one point. The first thing to know about the stock market's eye-watering slide Monday is that it wasn't caused by anything fundamental. There was no particular piece of news that drove the major averages to capsize, in a move that sent the Dow industrials off more than 1,500 points — a new intraday record — briefly in the final hour of trading. Instead, the market took on a mind of its own, where sentiment and likely some computer-programmed trading sent Wall Street into a bizarre tizzy. Fear brewed over a number of issues, with the biggest being trepidation about rising interest rates even though government bond yields actually were lower on the day. "Panic is already starting to set in, which is kind of incredible when you actually think about it," said Michael Yoshikami, CEO of Destination Wealth Management. "The S&P is trading where it was in sometime in December. So it's not like we're retracing an entire 12 months of returns here. I think investors are just understandably nervous. It probably is programmed trading kicking in at this point." Others blamed the Fed for the market breakdown, or least the mentality that led to the selling climate. The central bank, following its meeting last week, noted that inflation looked to be on the uptick. That put the market on notice, a point that was echoed when the government Friday said average hourly earnings rose 2.9 percent in January, the fastest move of the recovery. Investors' minds quickly turned to a more aggressive central bank and the prospect of a faster pace of interest rate hikes. "I'm not worried about this move. This is all a Fed move," said Joe LaVorgna, chief economist for the Americas as Natixis. "If you don't think there's inflation and you don't think the Fed's going to be as aggressive as the hawks would have you think, this equity sell-off should be bought." Still, investors could be forgiven for having flashbacks about some of the market's most vicious drops. The Dow fell throughout the morning, but the dive that happened around 2:40 p.m. ET actually resembled the violent 2010 flash crash. However, no trading desks contacted by CNBC reported trading issues in Monday's big sell-off. Sure enough, markets recovered somewhat just as they did that on that May 6 event nearly eight years ago. But the damage could be substantial to the collective investor psyche. "This is scary. A lot of people made a ton of dough over the last nine years," said Stephen Weiss, founder and managing partner at Short Hills Capital Partners. "I think we've got some more to go. There's not a catalyst to step in." The frightening contraction happened to a market that looked bulletproof. The Dow had soared more than 40 percent since President Donald Trump's election, a period that included an impressive nearly 20 percent rise in the S&P 500 for 2017 and the fastest start ever to a year in 2018. "The market simply did not take into account that you can't go up like this that long," Yoshikami said. "The key thing that I think people keep in mind here is that the market moves a lot very quickly, it doesn't mean fundamentals are changing that quickly," added Richard Bernstein, CEO of Richard Bernstein Advisors. "What you are seeing is the recalibration among investors that we actually are in a late-cycle environment." —With reporting by CNBC's John Melloy, Bob Pisani, and Michelle Fox. The digital currency briefly falls below $6,000 to its lowest since mid-November, according to CoinDesk. The decline follows reports in the last week that have raised worries about increased regulation and potential price manipulation at a major cryptocurrency exchange. The heads of the U.S. Securities and Exchange Commission and Commodity Futures Trading Commission are also set to testify before the Senate Banking Committee on Tuesday. Bitcoin dropped to its lowest in more than two months. The digital currency fell to a low of $5,947.40, its lowest since mid November, according to CoinDesk, whose bitcoin price index tracks prices from four major exchanges. At a price of $6,088.02 at 8:56 a.m. London time, the cryptocurrency was down more than 11.9 percent on the day, according to CoinDesk. The site measures bitcoin based on Coordinated Universal Time — currently the same time zone as the U.K.
With that decline, bitcoin has now lost more than 50 percent for the year so far. The latest sell-off follows reports in the last week that have raised worries about increased regulation, hackers and potential price manipulation at a major cryptocurrency exchange. On Friday, J.P. Morgan Chase, Bank of America and Citigroup also said they have decided to ban cryptocurrency purchases by their credit card customers. A report from China's Financial News on Sunday said authorities will increase efforts to restrict virtual currency trading platforms, especially those that may have moved overseas following Beijing's ban on initial coin offerings in September. The South China Morning Post first highlighted the report. In prepared remarks, SEC Chairman Jay Clayton said investors should remain cautious about investing in cryptocurrencies and gave an overview of the commission's efforts so far. Bitcoin remains several hundred percent higher over the last 12 months, while ethereum and ripple are several thousands of percent higher. The noted economist thinks the price of bitcoin is going to zero. Roubini, who is also known as "Dr Doom," claimed some people will use a market manipulation tactic known as wash trading to prop up the bitcoin price. He called bitcoin the "biggest bubble in human history" last week. Noted economist Nouriel Roubini thinks the price of bitcoin is going to zero. The chairman of Roubini Macro Associates, also known as "Dr Doom" for his pessimistic economic outlooks, called the price crash on Twitter on Tuesday. Bitcoin crashing now to $6,100. And the US Hearing on cryptoscams is only a day away. So a $5K handle looks highly likely unless the crypto-manipulation gangs starts pumping and dumping or wash trading again. So HODL nuts: be ready for a 75% loss from recent peaks. Roubini was referencing a Congressional hearing that will see Christopher Giancarlo, chairman of the Commodity Futures Trading Commission (CFTC), and Jay Clayton, chairman of the Securities and Exchange Commission (SEC), testify in front of lawmakers about cryptocurrencies. The economist also used the term HODL, which stands for "hold on for dear life." Itoriginated in an online forum when someone spelled the word "hold" wrong. It has now become a meme and is often used in times of extreme volatility in the cryptocurrency market for people holding rather than selling. Roubini said that "HODL nuts" will hold bitcoin until it plummets to zero. Dr Doom also said that traders will use wash trading to prop up the prices. Wash trading in the crypto world involves someone buying and selling their own order to manipulate markets. Some have feared that wash trading takes place on bitcoin exchanges. Roubini asked if the authorities will look into this practice. As Bitcoin crashes to a $5K handle the wash traders move rapidly into action to prop it up...price and quantity action now clearly consistent with criminal wash trades...will the SEC and CFTC start looking into these criminal activities? His tweets followed comments on Bloomberg last week in which he called bitcoin the "biggest bubble in human history." Cryptocurrencies have seen a major sell-off in the last few days. Bitcoin fell below $6,000 for the first time since mid-November on Tuesday. Other major cryptocurrencies are all well off of their all-time highs. Nigeria’s manufacturers are spending more on diesel, gas, inverters, UPS and other alternative energy sources, indicating poor levels of power supply across Nigeria. Local manufacturers spent N66.03 billion on alternative energy sources between January and June 2017, as against N62.96 billion expenditure made in the same period of 2016, according to a latest report prepared by the Manufacturers Association of Nigeria (MAN), sent to BusinessDay. The largest chunk of expenditure went to diesel, which occupied 39.4 percent of the total. While N26.02 billion was spent on diesel, N21.35 billion was expended on procuring new generators within the period. Also, manufacturers spent N17.75 billion on gas, while N906 million was for inverters, UPS, and other power storage and purifying gadgets. “Energy shared 36 percent of the total cost of production in the manufacturing sector within the period. This accounts for the poor competitiveness of made-in-Nigeria goods,” MAN says. The report shows that the average daily electricity supply in H1 of 2017 declined to five hours, from seven hours supplied in the corresponding period of 2016 and eight hours in the preceding half. Poor power supply ranks among the biggest challenges facing Nigerian manufacturers, which also include lack of or limited availability of good transportation systems, water, credit and high taxes. Diesel is mainly used by small and medium manufacturers, while large enterprises, including conglomerates and multinationals, use gas plants. Aliko Dangote, president of Dangote Group, installed coal-fired plants for his cement factory in 2016, and urged large enterprises with financial muscles to do the same. Coal is cheaper than gas, diesel and Low-Pour Fuel Oil (LPFO). Gas is however subject to availability. Early this year, the Escravos-Lagos Pipeline (ELP), a natural gas pipeline, which supplies gas from Escravos region of the Niger Delta area to Lagos, was ravaged by fire, shrinking the levels of gas available for manufacturers. Gas users contend that dollarising the product is not in the interest of manufacturers who are scrambling for dollars to import inputs. “There is a need to review the pricing policy of gas companies which prescribe payment in dollars for gas used by industries,” Babatunde Paul Ruwase, president, Lagos Chamber of Commerce and Industry (LCCI), said at the State of the Nation press conference in Lagos on January 24. “We believe this is not consistent with the objective of promoting industrialisation, economic diversification and job creation. Most manufacturers are producing for the domestic market; it is therefore inappropriate to compel them to pay for gas in dollars,” Ruwase said. Similarly, manufacturers are increasingly abandoning power distribution companies popularly called DisCos for private companies that can provide 24-hour incremental and quality electricity at cheaper rates. Already, the Manufacturers Association of Nigeria, through its recently formed MAN Power Development Company, has signed an agreement with Tower Energy Solution & Systems Limited for the supply of six to 10 megawatts (MW) of electricity to Henry Carr Industrial Cluster in Ikeja, Lagos. MAN has an agreement with Negris Group for the supply of up to 80 MW of electricity to Odogunyan in Ikorodu industrial cluster. The organisation is also talking with solar power supply firms in the northern Nigeria, where there is limited gas supply, to enable clusters in Kaduna, Kano and other parts of the north to have incremental power at cheaper rates. Similarly, a negotiation is on the pipeline with Sahara Energy, Geogrid LighTec Limited and other companies for the supply of power to industrial clusters, according to Ibrahim Usman, chairman of MAN Power Development Company Limited. “The idea is to be able to put manufacturers together in clusters and arrange for power, which can be supplied through providers that will engage in power supply through hydro, solar, gas and will remove the cost of manufacturers getting involved in producing their own power, “ said Reginald Odia, chairman of Economic Policy Committee of MAN and director of the MAN Power Development Company. Nigeria is not only the biggest country in Africa; it is also the continent’s most foolishly generous. With 20 million litres smuggled out of the country daily, Nigeria’s subsidised petrol is a favourite commodity on West Africa’s black markets. The sale of illicit Nigerian petrol has become widespread across the West African sub region helping to oil black markets and distorting price mechanisms of these countries. Nigeria’s retail price peg of N145 per litre is not only hurting investments in the downstream sector, it is encouraging smuggling across its porous borders. On roadsides in Cameroun and other West African countries, vendors fill customer’s car, using the cut-off top of a plastic bottle as a funnel. The fuel is less expensive with a 30 litres of petrol costing FCFA 17,000 in the country rather than FCFA 19,000 at the pump according to a report by African Arguments, a pan-African news platform on issues plaguing Africa. This translates to N382 per litre on the streets and N426 per litre at the pump. With landing cost of petrol in Nigeria put at N171 per litre, the Nigerian National Petroleum Corporation (NNPC) incurred N37 on each litre of fuel at a depot price of N133.80, leading to a daily subsidy of N2.046billion for 55million litres. The landing cost of petrol has been higher than the pegged retail price of N145 per litre, after crude oil prices rose to $45 per barrel in January 2017. This puts total subsidy spends since February 2017 to date at N746.79billion, according to BusinessDay calculations. There is no better manual on how to self-destruct an economy. This figure is higher than budgetary allocation for the ministry of Power, Works and Housing (N555.88bn), transportation (N263.1bn), Agriculture and Rural development (N118.98), Universal Basic education (N109.6bn) and combined capital expenditures for defence (N145bn), health (N71.11bn) and education (N61.7bn) according to an analysis by SBM Intelligence. On January 24, the Nigerian National Petroleum Corporation (NNPC) raised alarm over the sustained nefarious activities of some cross-border fuel smuggling syndicates that makes it difficult to account for about 20million litres of fuel a day. Maikanti Baru, Group Managing Director of the state-owned corporation, told the Joint National Assembly Committee on Petroleum Downstream that if the activities of the fuel truck diverters and smugglers were left unchecked, it would constrain local supply. Worse still, the economies of these neighbouring countries, such as Benin, Ghana and Togo are feeling the squeeze. At the 11th edition of Oil Trading & Logistics Expo that held in Lagos from October 23 – 25, Mohammed Amin Adam, deputy minister of Energy Ghana while delivering the keynote address, said Nigeria’s regulated price is distorting price mechanisms in the region. Adam said that policy is not only unsustainable but creates problems for its neighbours. Adam argued that since Nigeria constitutes the region’s biggest market, its policies has serious impact for other countries in West Africa. “On this note, I wish to call on the Nigerian government to make efforts at reaching full price deregulation given that it is the largest market for products on our continent and any failure at reaching full price deregulation will lead to distortion on the sub regional market on the continent,” said Adam. Petrol smuggled from Nigeria is known as “Funge” or “Zoa Zoa”, in Cameroon’s North West region. “When police officers raid this area and collect bribes from vendors, they increase prices to make up for what they paid to the police,” someone patronising the roadside fuel sellers told Africa Arguments. In the city, buyers say price is far from the only benefit to buying petrol in this way. Despite the fact that Cameroon is one of Africa’s biggest oil-producers and sold 17 million barrels of crude in 2017, sale of illicit Nigerian petrol has become a common sight across the country. Meanwhile, in Nigeria where, over 1.9million barrels are produced daily, citizen’s continue to sleep in fuel stations to get petrol subsidised in Lagos and Abuja. A centrally controlled market for petrol which is the most consumed petroleum product in the sub region creates room for smuggling and discourages investments in the downstream sector of the region, stakeholders say. “At the same time, we must put in place polices that punish domestic anti-competitive behaviours. This will make deregulation polices become effective instruments for increase in public confidence in our markets and prevent us from turning to the days of subsidies and under recoveries which have very negative long-term effect on many economies on our continent,” said Adam. President Muhammadu Buhari has signed bilateral air service agreements with the People’s Democratic Republic of Algeria; the Republic of Congo; the People’s Republic of China; the State of Qatar and the Republic of Singapore.The Instruments of Ratification of the Bilateral Air Services Agreements signed on Monday by Buhari were approved by the Federal Executive Council (FEC). “With the execution of these instruments, it is expected that Nigeria’s aviation links with the respective countries will improve significantly,” the statement read in part. Buhari also signed the Executive Order 5 to improve local content in public procurement with science, engineering and technology components. The Executive Order is expected to promote the application of science, technology and innovation towards achieving the nation’s development goals across all sectors of the economy. “The President, pursuant to the authority vested in him by the Constitution, ordered that all ‘procuring authorities shall give preference to Nigerian companies and firms in the award of contracts, in line with the Public Procurement Act 2007,” the presidency said on Tuesday. The Executive Order, according to the presidency, also prohibits the Ministry of Interior from giving visas to foreign workers whose skills are readily available in Nigeria. According to the instrument, where expertise is lacking, procuring entities will give preference to foreign companies and firms with a demonstrable and verifiable plan for indigenous development, prior to the award of such contracts. Buhari also directed Ministries, Departments and Agencies to engage indigenous professionals in the planning, design and execution of national security projects. It added that ‘‘consideration shall only be given to a foreign professional, where it is certified by the appropriate authority that such expertise is not available in Nigeria”. The euro fell on Monday after Chancellor Angela Merkel’s efforts to form a government in Germany collapsed overnight, leaving the eurozone’s largest economy in political limbo almost two months after its general election. The currency fell 0.5% against the U.S. dollar, its biggest decline since Oct. 26, to $1.1733. The euro also lost 0.6% against the British pound to €1.1279 per pound. The Wall Street Journal dollar index, which measures the currency against 16 others, rose 0.4% to 87.40 from 87.09 Friday. Investors continue to focus on the odds of a tax bill passing in the Senate, where a vote is scheduled after Thanksgiving. Ms. Merkel’s conservative alliance won the September election but finished with its worst result since 1949, forcing the longtime German leader to try to cobble together a coalition with a majority in Parliament. That effort hit a roadblock late Sunday in Germany after the chairman of the small, pro-business Free Democratic Party ended talks with Ms. Merkel’s conservative camp and the center-left Greens. “It’s very concerning, and creates this big uncertainty in the eurozone,” said Kisoo Park, a global bond manager at Manulife Asset Management in Hong Kong, adding that he expects the euro to fall further in the short term. The collapse of coalition talks in Germany is the latest episode of political turmoil to hit Europe. Spain has cracked down on the region of Catalonia after it declared independence following a referendum the Madrid government had deemed illegal. Meanwhile, the U.K. has made little progress in its divorce proceedings from the European Union. The prospect of prolonged political uncertainty in Germany is particularly worrying for markets. Ms. Merkel has long been seen as Europe’s pre-eminent political leader, having steered Germany through both the global financial crisis and the subsequent crisis in Greece. Her decision to let in hundreds of thousands of refugees and migrants from Syria and other countries in 2015 stoked strong domestic opposition, however. Anti-immigration party Alternative for Germany performed strongly in September’s election, winning some 13% of the vote. “Germany has been the more stable country in the region and globally, but if that goes away, then that could cause a cascade of fallouts,” said Mr. Park, citing possible effects on the Brexit talks and parliamentary elections due next year in Italy. Ms. Merkel will continue to lead a caretaker government in Germany for now. The chancellor could try again to woo enough parties to form a ruling coalition, or attempt to run a minority government. A further option is for Germany to have a fresh general election. Despite periodic political problems in Europe this year, the euro has surged more than 11% against the U.S. dollar. The common currency has also advanced nearly 7% against the yen and more than 4% against the British pound so far in 2017. “What we’ve seen globally is a shift to more extreme parties. The euro has managed to ride this out, and the reaction in the euro [this year] has been much more dependent on growth,” said Mitul Kotecha, head of Asia foreign-exchange and rates strategy at Barclays in Singapore. The eurozone economy is on track for its strongest year since 2007, though growth slowed slightly in the third quarter and inflation fell. That combination of improved economic growth and low inflation should ensure that the European Central Bank will begin reducing its monthly bond purchases slowly, much like the Federal Reserve, as it begins to unwind its easy monetary policy. Mr. Kotecha said he still expects the euro to end 2017 at $1.17, near its current level, and he expects the euro to rise further next year, driven by improving growth and a weaker dollar. —Andrea Thomas contributed to this article.